Ruth works for Community Land Scotland although she writes here in a personal capacity. During the summer of 2009, she spent six weeks volunteering at the Tent of Nations farm in the West Bank, Palestine. 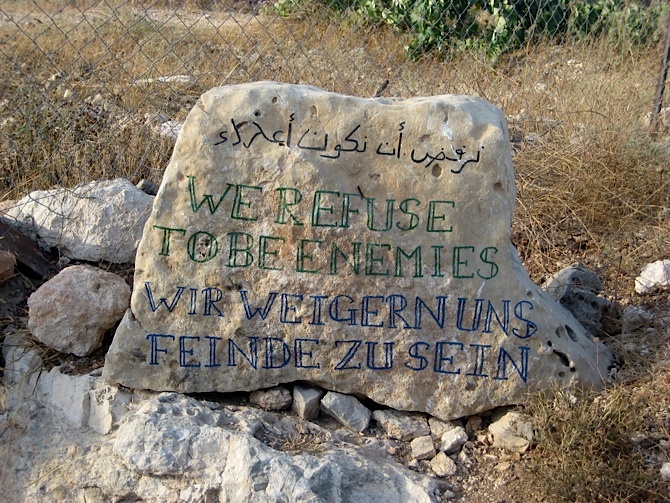 “We refuse to be enemies” is the sentiment upon which the Tent of Nations project in Palestine is built. Painted on a stone which greets every visitor to the Nassar family farm, where the project is based, the phrase encaptures the deep sense of humanity, resolution and faith which emanates from the 100 acres of land and the family who own it. At 8am on Monday 19th May 2014, Israeli Defense Force (IDF) bulldozers arrived unannounced – presumably rolling past the Nassar’s defiant welcoming statement – and proceeded to destroy between 1,500 and 2,000 mature, fruit-bearing apricot trees, apple trees and grape vines in the lower valley of the farm. Resting on a hill six miles southwest of Bethlehem in the Occupied Territories of Palestine (the West Bank), the Nassar family hold registration papers for this land dating back to the Ottoman Empire. For over 20 years now, the family have been fighting a legal battle to prove their ownership of the land. For over 20 years they have been challenged by knock-backs, obstacles and violent provocations. The attack at the beginning of last week comes while their latest case for proving ownership has been in the Israeli Military/Civil Courts since February 2013. 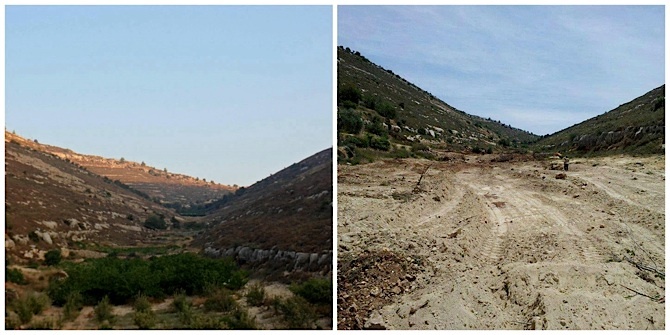 Image: The valley before and after the bulldozers arrived. In 2001 the Nassars set up the Tent of Nations peace project on their farm; a project committed to building intercultural cooperation and understanding; to promoting dialogue and non-violence and to highlighting the connection between people and land. As a volunteer in 2009 (planting and harvesting many of the trees now destroyed), I was struck by the family’s steadfast resolve to remain on their farm despite the pressure to have it evacuated and claimed as Israeli State Land. I noted in a blog during my time there the “shuwe, shuwe” (“slowly, slowly”) attitude to the Nassar’s work; commenting that it “sums up their calm, thoughtful and sustained approach to dealing with an intense and emotional situation.” Such an approach couldn’t be more necessary now as they cope with this latest act of oppression; as ever – they are rising to the occasion with dignity and hope. In addition to the destruction of the trees, the terraced land on which the trees were planted was also destroyed and left in a state of rubble which cannot currently be re-planted. Having generated income from the fruit of the mature trees, the family are faced with an attack on their livelihood as well as their property. As advised by their lawyer, the Nassars are now appealing for compensation; critically, they are also appealing to have the demolition orders which remain on the tents, compost toilets & other structures on the farm removed. They have asked for international awareness to be raised and for the international community to support their case and to understand that the injustices they face are representative of the oppression faced by the wider Palestinian population. If you’d like to take action to support the Nassar family and hold the Israeli Military and Government to account for its actions, please write to your MP using this standard letter – doc and rtf. See the Tent of Nations website Facebook and twitter for more information and updates. This account gives only one side, the IDF usually only do this sort of thing where land is used as cover for terrorist attacks … any chance of hearing the other side of the story ?! I have personally visited the farm several times, stayed and worked with the family. I find your comments about “terrorist attacks” both offensive and ignorant. This action by the IDF is not only against international law, it is against Israeli law. This act represents an attack on the family’s livelihood as well as their property. Their actions must be called to account and compensation offered for the damage caused. Why if there were terrorists in the area would it be necessary to destroy an entire farm. The IDF have a very heavy handed approach to whatever they do something acknowledged by many who have served with them.